I have had a project floating around in my head for a few years now that I knew I would LOVE…HORIZONTAL STRIPES! 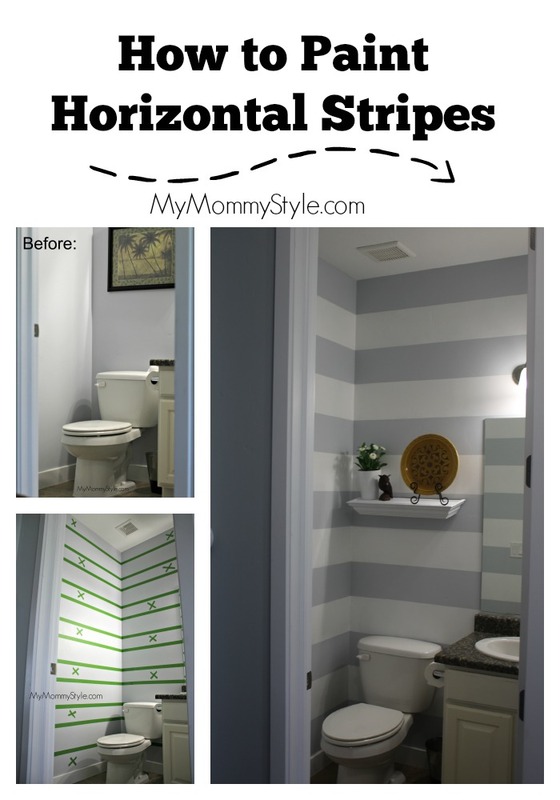 I knew I wanted it in my small powder bath by the kitchen because it is a small space and horizontal stripes would actually help it to look larger. We moved into our home only two years ago and my husband LOATHES painting. We chose a light blue/gray color that we loved and it is in the whole house. We even did a vinyl project in the nursery because my husband hates painting so much! HA! So when we were approached my Frog Tape to do a project using their tape I knew EXACTLY what I wanted to do but just had to convince the hubs it was a great idea too! 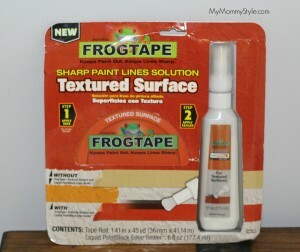 This is the first time I have ever used FrogTape® and I know from experience using other tape before that there is a HUGE difference in quality especially if you are trying to paint a textured surface (which all of my walls are), and if you are wanting to paint a very sharp, distinct line. Full Kudos goes to Paul for doing the taping. He is something of a spacial/measuring genius who is great with numbers. I on the other hand, am better at the actual painting part which made this project a lot more fun because it was broken up that way. If you have a partner in crime to help you paint the stripes take them up on it! 1. Measure twice cut once! 2. Measure from the baseboard to the ceiling in all 4 corners of the room. Your room will most likely not be completely straight, so you will need to choose one corner that will be slightly off. I chose the corner that is least visible. 3. Draw a diagram of your project and do the math. This is the most important step! From the ceiling to the top of our baseboard was 104 inches which made for 13×8 inch wide stripes. 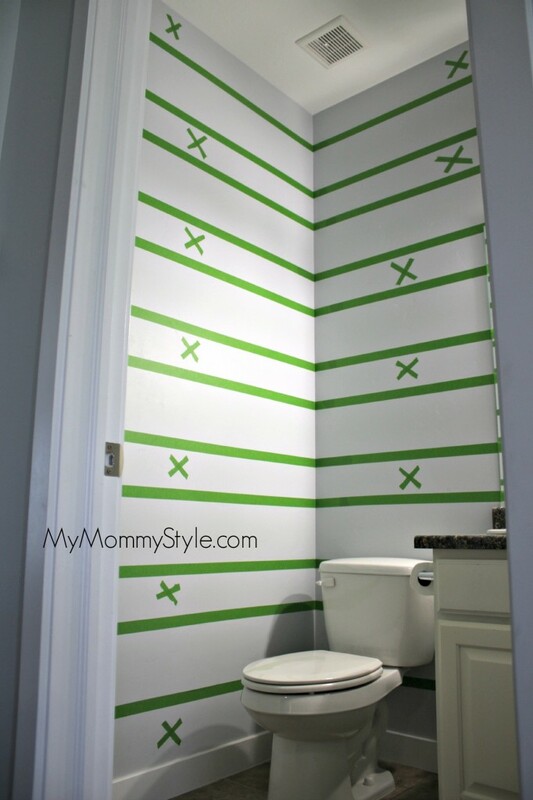 I wanted to do as little taping as possible so I made sure my stripes were not up against the baseboards or ceiling. It always pays to diagram your project and think about it before jumping in to taping. 4. Measure from the baseboard not the ceiling – i.e. start from the bottom. 5. Make sure your tape edge is against the side you are painting. This will make your taping look uneven, but once removed it will look perfectly even. 6. X-out the areas you will not paint, so you can easily paint without thinking. 1. Prep tape with Paint block FrogTape® is treated with patented PaintBlock® Technology, a super absorbent polymer that reacts with the water in latex paint and instantly gels to form a micro-barrier that seals the edges of the tape, which helps prevent paint bleed. This step is VERY important! I missed a few spots and could tell a difference…ha! They were hard to reach places. So if you can, really try to get it every place you will be painting. 2. “Cut” in corners with paint brush and hard to reach places, paint first coat. Let dry a couple of hours. Notice that we put an “X” in the spaces where you will not be putting tape. This is extremely helpful when you are in the middle of painting because those lines can really get confusing. 3. Repaint corners and hard to reach places a second time, paint second layer. Make sure that you are using the roller to create a nice thick layer of paint. I found that the results were just as good if I painting up and down or side to side so just do whatever is comfortable to you. 4. Bring someone in the room to see if you missed any spots. This is so important because sometimes you will miss a spot that isn’t as thick as the others and another person can step into the project and spot these things easier than you can when you’re in the middle of the project. 5. Remove tape Make sure to keep a constant pressure and pull. You are supposed to do this while the paint is still wet. Confession: we had to run off to a birthday party and didn’t get to taking the tape off until a few hours later and it was just fine. I was really scared but the results were beautiful and hubby loves it too! Remember that picture I had in the bathroom before? I was taking the picture out and discovered this vintage picture of men with umbrellas. It is completely random but I loved it and used it to inspire me with the rest of the decor in the room! 6. Always remove painter’s tape while paint is still wet. FrogTape® (the makers of Shape Tape™) has a Textured Surface™ board on Pinterest! What can you see yourself using FrogTape® for?